Seattle Home Inspector's Blog: Why is my roof sheathing black? Why is my roof sheathing black? When moisture condenses on plywood roof sheathing repeatedly or continuously the wood will turn black. This can be caused by the action of fungal growth and molds and the affect they have on the tannins in the wood. The following picture is of a long standing moisture condition in an attic where much of the roof sheathing has turned black. There were some areas with obvious mold or mold-like fungal growth present but many areas just appeared to be stained. Any time the inspector finds this kind of ongoing staining the prognosis for the roof is not good if repairs are not made. Of course the primary concern is figuring out why there is so much moisture in the attic. The large hole in the side of the outer layer of pipe is where the flue gases are entering the attic instead of going the rest of the way up the vent pipe to the exterior. The big question here is: Why didn’t the HVAC contractor check the vent pipe when the furnace was replaced? In my experience, most b-vent pipe has a life span about the same as the furnace. 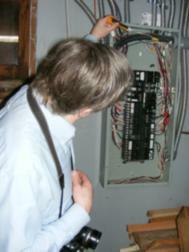 Its condition should at least be checked when a furnace is replaced. Why indeed? It also makes you wonder if the home owner never went into their own attic space. You would think they would have noticed that! Or at least the person servicing their unit would! Charles: Given the amount of black on this wood sheathing, will this roof need replacing, or will the repairs be enough? Looks similar to the roof sheathing from my last inspection. There we numerous and obvious (to me) reasons for the condition. Charles -- it is interesting that the furnace people did not check the piping when they were replacing the furnace. One would guess they are not fully the professionals they may advertise themselves to be. Kathryn, I would say that most home owners rarely go in their attics and pretty much never go in their crawl spaces. Steven, and I see this over and over again---it surprises me too that this isn't considered part of what they are responsible for---seems like easy money to me. Charles, I learn stuff from you I never find anywhere else. Black roof indeed! Charlie, I have seen this like you eluded to, from other sources. Sometimes it is not just one thing but many. Also adding to the load is the occupants not using ventilation when they have it. If they just paint the sheathing and rafters black, all that gets covered up. Problem eliminated! Last week the upstairs apartment of the duplex I was inspecting was so humid the condensation was occuring 6" up from the bottom of the windows. No kitchen exhaust, no bathroom fan exhaust, laundry dryer vented indoors, heat turned way up and the residents were dressed, long sleves, sweaters & jackets. They had 2 humidifiers going! It was a nice day out too, above freezing. I say, if you want to live in the tropics...go there! Wow, what a mess. I'm pretty sure it's standard procedure for HVAC contractors to not check any of the venting in the attic, ever. I don't think it's ever been done.